This website uses first-party cookies but respects your privacy. King's Staith was York's main quayside during the medieval period. It is now a popular and characterful leisure location (except when the river is in flood). The word 'staith' (and the alternative spelling 'staithe') originates from the Old Norse word 'stǫth', meaning a landing stage. Its common use across north-eastern England is a legacy of the Viking occupation during the 9th, 10th and early 11th centuries. The prefix (King's) is a relatively recent addition. It does not commonly appear in historical records until the 17th century and the reason for its introduction is not recorded. It may have been added to acknowledge the royal grant of 'quayage' (see below), to commemorate a specific royal visit, to demonstrate the city's loyalty to the Crown, or simply to distinguish it from the other commercial staithes that were beginning to appear within the city during this period. King's Staith on the north-east bank of the River Ouse in York. The moored leisure boats and al-fresco diners add charm and character to this quintessentially English riverside scene. The riverside location and south-west aspect make King's Staith and the South Esplanade extremely popular places to relax and unwind. 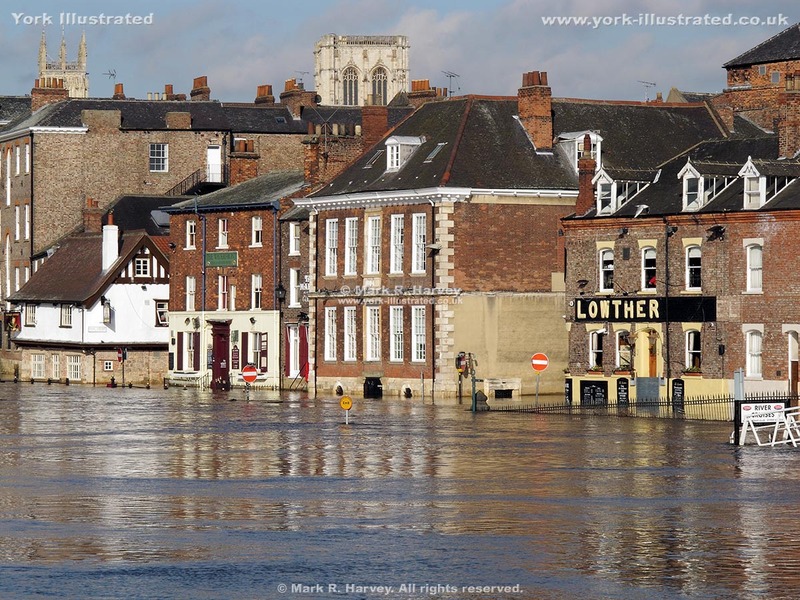 The perfect spot for a meal, drink, chat and / or stroll, unless . . .
. . . the River Ouse is in flood. While photographically attractive, this relatively frequent experience has a massive negative impact on the people who live and work in the historic buildings in this part of the city. 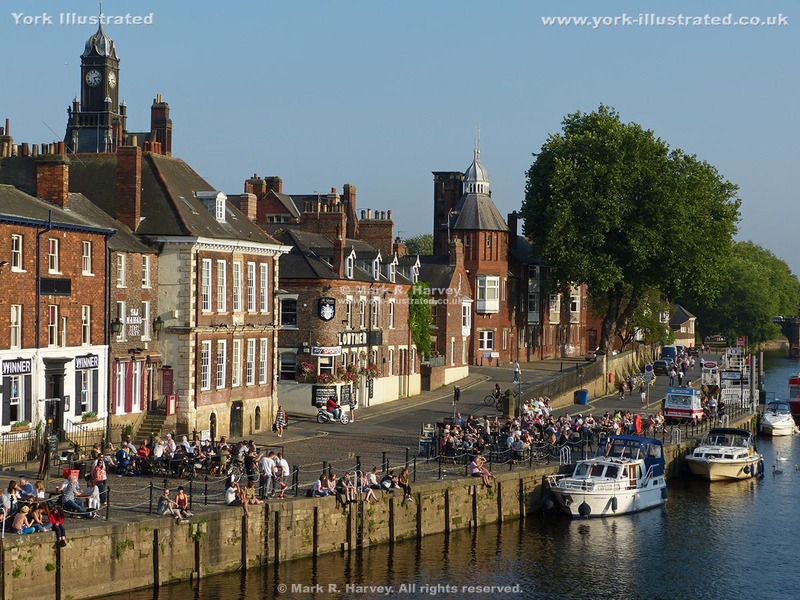 The steps visible towards the left of this image form part of the riverside walk, linking Ouse Bridge and Bridge Street with the quayside at King's Staith. 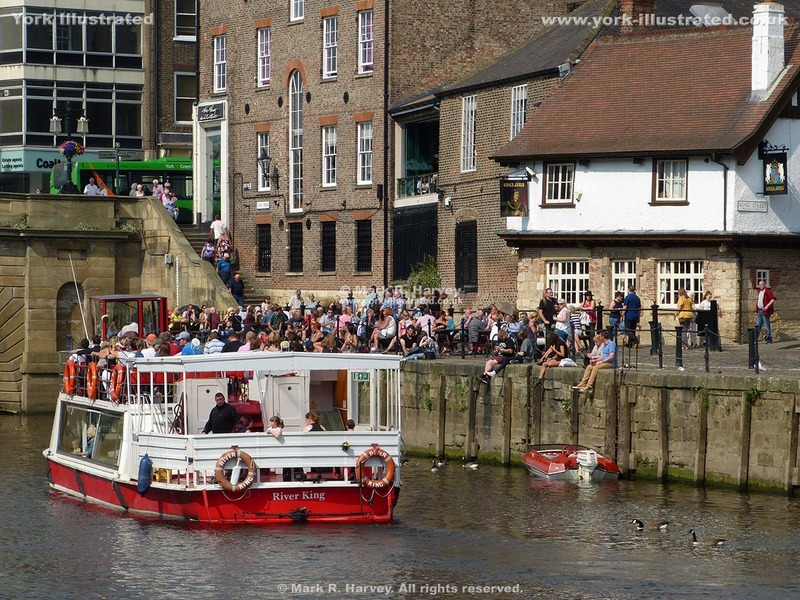 York's rivers (the Ouse and the Foss) have been used as transport routes for at least two thousand years. Before humans intervened, both rivers were tidal and both were naturally navigable (with care) between York and the Humber Estuary (which gave access to the North Sea). Throughout the first millennium AD, suitably sized boats could use these 'common highways' without legal restriction and without incurring any tolls or taxes. Small flat-bottomed boats could be beached close to the riverbank at high tide, loaded or off-loaded at low tide, then re-floated during a subsequent high tide. However, this would have been a muddy process and it would have been difficult to load / unload larger vessels in an efficient manner. The solution was to construct a quayside or jetty to support the boats in a more upright position and to provide easier (and cleaner) access between boat and shore at all states of the tide. Archaeological evidence of such structures dating from the Roman, Anglo-Saxon and Viking periods has been found at dozens of locations along both banks of both rivers. a wide variety of foodstuffs including wheat, flour, barley, malt (malted barley), fish, wine, salt and spices. During the 17th century, the staith was extended southwards along the front of 'The Friars’ Walls' (creating the forerunner of the quayside now known as the South Esplanade). In 1774, the height of the staith was increased and its surface was repaved. In 1820, the staith was completely rebuilt as part of works to replace the adjacent Ouse Bridge. Despite these improvements, the commercial importance of the King's Staith steadily declined from the middle of the 17th century onwards. The process of change started when the city authorities began to permit the construction of competing quays elsewhere on the River Ouse. As an example, Topham's Staith was constructed on the opposite bank of the river in 1660. (This later became the Queen's Staith.) In 1793, Parliament passed the 'Foss Navigation Act', which allowed commercial traffic to return to the River Foss after an absence of almost seven hundred years. By the 19th century, there were (once more) dozens of quays and wharves along both banks of both rivers. However, while the rivers continued to carry significant amounts of commercial traffic, the usefulness of (and therefore the use of) the King's Staith steadily declined. Retail businesses within the city centre increasingly turned to road transport to meet their distribution needs and, during the second half of the 20th century, most of the city centre manufacturing and warehousing businesses either ceased trading, or relocated to industrial estates on the outskirts of town. By the early 1970s, the King's Staith had become little more than a riverside car-park. Fortunately, as a result of the growth in the leisure economy, the area has acquired a new purpose and today it is the perfect destination for a riverside stroll and a pleasant place to sit and watch the world go by. The ramp leading into the river from the quayside is the approximate location of an area referred to in historical records as 'the Pudding Holes'. This was a public washing place where city ordinances specifically permitted citizens to wash clothes, gut fish and rinse animal giblets. The latter included animal intestines, which were then stuffed with a mixture of animal blood, animal fat and processed cereal grains before being boiled to make black-puddings (the latter being one possible source of the name given to this part of the staith). View this location on an interactive map. 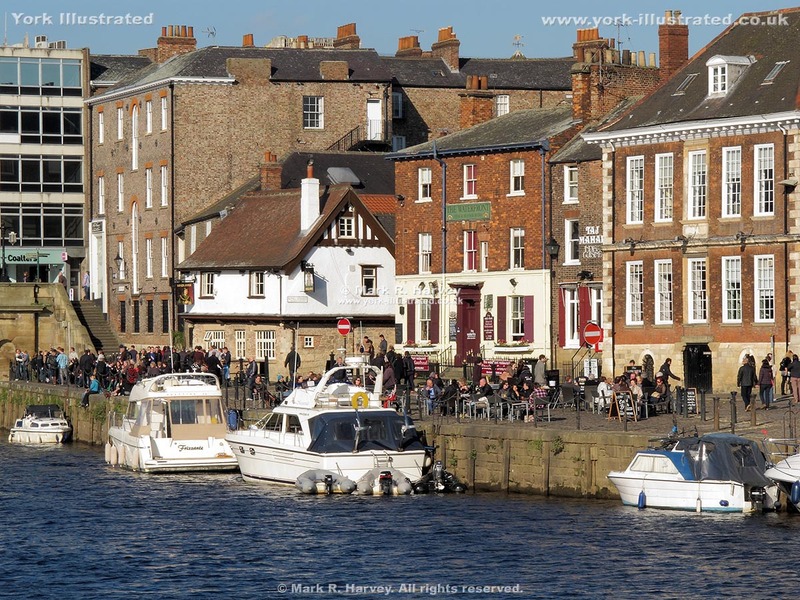 The King's Staith forms part of a pleasant linear walk beside the River Ouse close to York city centre. The route links Skeldergate Bridge (near York Castle / Clifford's Tower) and Lendal Bridge (near York Railway Station and Museum Gardens) via Tower Gardens, South Esplanade, King's Staith, Ouse Bridge (near the city centre), North Street Gardens and Wellington Row. However, please note that this entire walking route lies within the functional flood plain of the River Ouse and that it may be inaccessible when the river is in flood and for the duration of post-flood clean-up works. Tip: To avoid clutter, the section(s) below are normally 'collapsed': to 'expand' a section, click / tap on the relevant title. Tip: Select an article or place from the list-box below, then click, tap or otherwise operate the 'Go' button to open the selected page. © Mark R. Harvey (2005 - 2019). All rights reserved. Moral Rights and Database Rights asserted. No liability can be accepted for errors or omissions in the information provided on this website, or for any consequences arising therefrom.